These I sent out on June 14th also, with all the others that I mailed out that day, so as with the others so far, I'm glad to have gotten them back this quick. I'm planning on using the one on the left for my cards display, and the one on the right for an "Inaugural Game" mini project that I'm working on. For this project, I already have a photograph of the overview of the stadium for the 1st game in Franchise History against the Oilers, a mint copy Game Program from the game itself, and am currently trying to track down a ticket stub from the game. 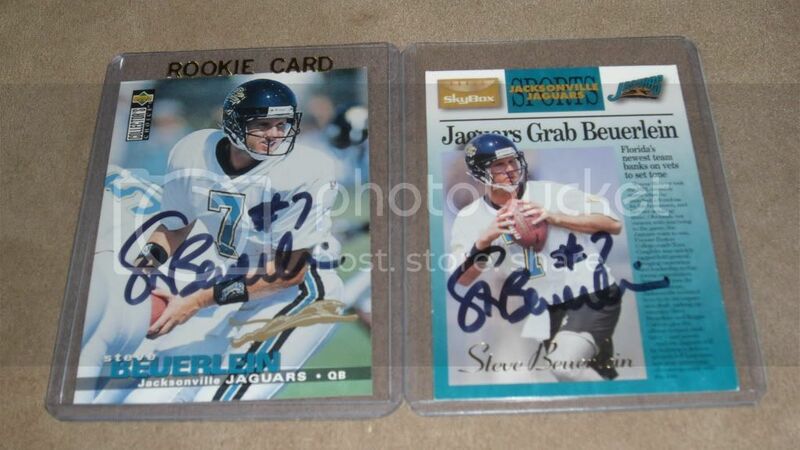 I was going to frame all 3 with the card pictured on the right, since Beuerlein was the starting QB for the game. And on a small note, I love when these guys inscribe their #.